We ushered in the new year at the opera, a thoroughly pleasant rendition of The Marriage of Figaro, with a bunch of old people in glitter, Eugene patricians, and disheveled graduate students. We fit somewhat awkwardly among them, jostling. Wasn’t a big fan of the hollering of “GO DUCKS!” or the redundant supertitle with the same sentiment, since I’m a jerk like that. But the evening was really lovely otherwise. Could this be because we started off with a round of Blue Moon cocktails? Indeed, I think it was. 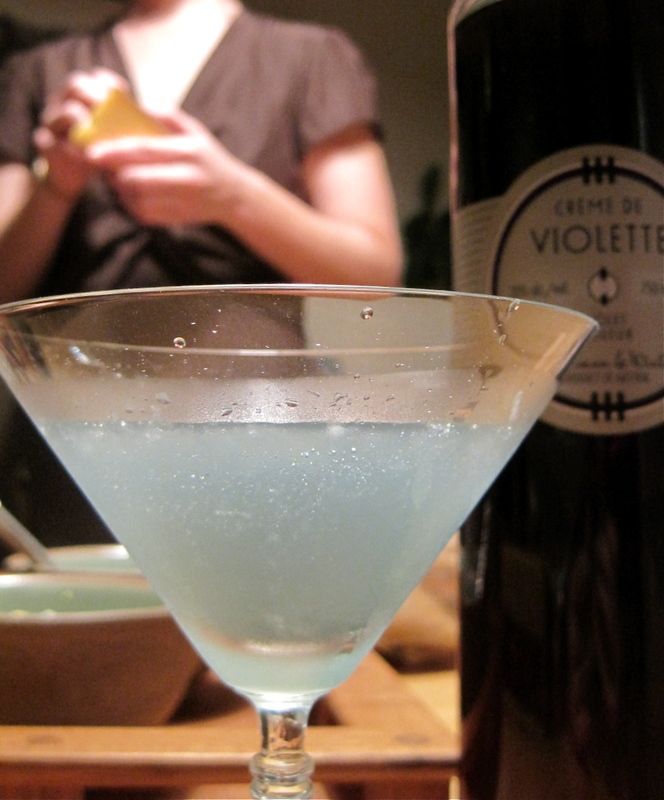 Married…with Dinner, one of my favorite food blogs, revisits the history of the Blue Moon, a lovely vintage cocktail now blasphemed with sugary, cheap blue curaçao. I was on the prowl for lunar recipes for my pre-opera cocktail hour when I came across her post. I knew immediately it wouldn’t contain a single drop of blue curaçao or similar villainy. I rushed down to the liquor store to buy Rothman Crème de Violette, thinking the few bottles we might have in town would be already snapped up by the few cocktail enthusiasts we have in town, but I got lucky. Thanks to “some bar” that had abandoned its stash, I scored a hidden bottle in the store archives. 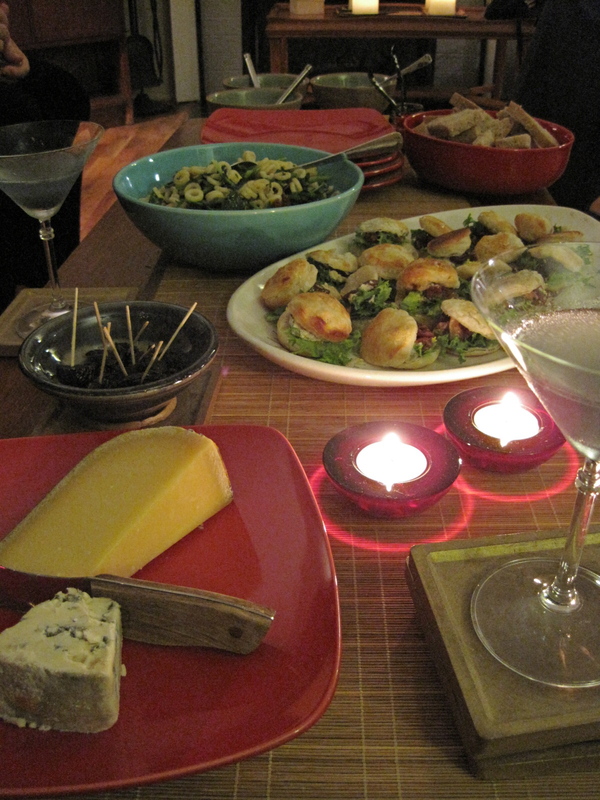 And with luck like that, I knew the evening was off to a good start for our casual, pre-opera nibbles. Of many good things, I’d like to note that Oregon’s award-winning Rogue Creamery’s Brutal Blue cheese, a new offering for the creamery, is fantastic: smooth and full-bodied with a sweet finish. I couldn’t stop eating it. There doesn’t seem to be any information on the internets about it, but it’s available in town at Market of Choice on 29th. If last night was any omen, the year is going to be a great one. Hope you ushered it in with the same kind of vibe. 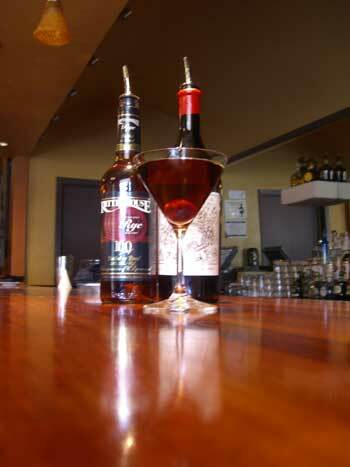 A recreation of a “Manhattan” served to a friend at Jo Federigo’s last night. * The recreation might even be a bit darker than the original, which was the pale-est straw gold in color. When it arrived at the table, it was so light I thought it was a martini with a glowing red maraschino cherry at the bottom. At this point in the evening, I had had two (cherry-free) martinis and didn’t even feel a tiny bit tipsy, so I thought it would be pointless to continue. Everyone else switched over to beer. Just thought I’d post this observation — it’s worthwhile, I think, to make note when a bar is watering down its drinks to ridiculous levels, especially if you’re paying $10 a throw. The jazz wasn’t bad, though. I won’t say anything about the food. * No whiskey was harmed in the making of this recreation, but I’ll admit that I ate the cherry. I’m on the road for a couple of weeks on official business, a conference in Southern California. Sadly, I am “stranded” in San Francisco for a few days before I move along, little dogies. Does this mean I will be eating and drinking my way through the Golden State? Why yes, I believe it does. 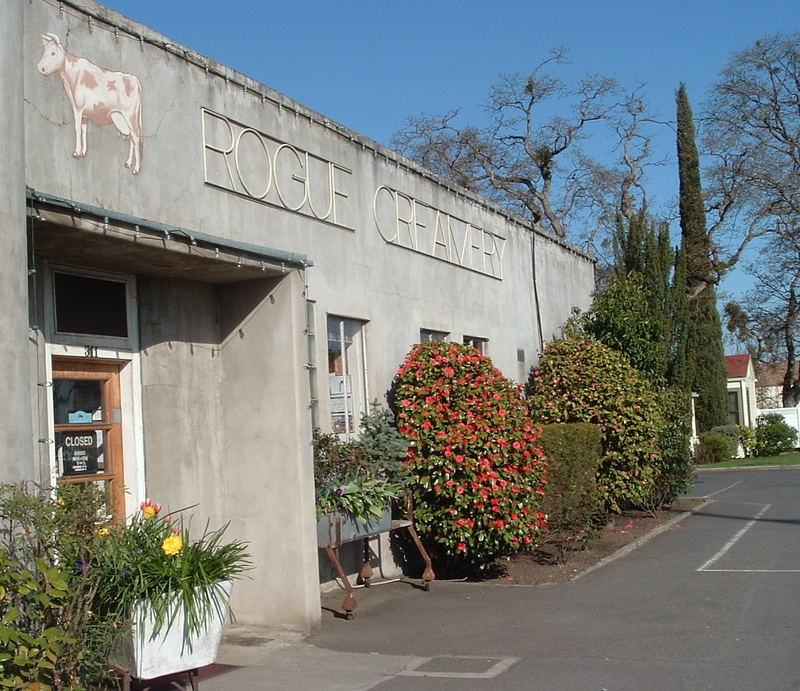 To fortify my spirits and arm myself with gifts, I stopped at the Rogue Creamery in Medford, OR, about two hours south of Eugene, fresh when they opened at 9 am. I had to represent, yo. So I bought a large chunk of Rogue River Blue and another of a new cheese, available only at the creamery. Last night, I discovered how to sustain the pleasure — drive immediately to Alembic bar thereafter. When I arrived, my friend was already there with our first cocktail, and yadda yadda yadda, we had tried half the menu and the evening was in its cups. 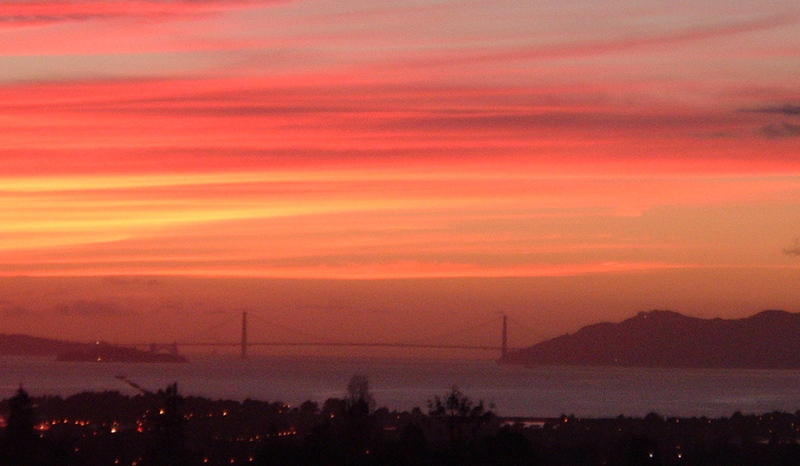 I’m now off to sit zazen in Berkeley Bowl, prowl thrift stores for errant Duralex Picardie glasses, eat Ethiopian food in Temescal with a friend, and listen to the sweet sounds of someone I don’t know’s guitar at a pub with other friends. Life could not be better. Any guesses on what’s the number one search term of all my posts, one that hits my site about three times more than any other phrase? How to cut an orange. Yes, folks, there is a serious dearth of information about the correct way to cut an orange. If I have any use in this world, anything they’d write on my epitaph, it will surely be that she knew how to cut oranges. And I’m glad to be of service. But one search term that has started to come up at first thrilled me, then made me disgruntled. I was happy to see that people have started to become interested about the buñueloni, the drink invented by film director Luis Buñuel that I spent months painstakingly (ok, not so painstakingly but OCD was involved) researching. I’m no mixologist, but I truly feel I’ve made one small contribution to cocktalian culture by pinning down the perfect rendition of this drink. So I did a search on “buñueloni cocktail” and I see the intarnets are now flooded with recipes on all the free drink dot com sites. WTF? Their “buñueloni cocktail” is most decidedly NOT. The buñueloni does not have dry vermouth in it, there is no lemon, no orange juice, it is not served in a white wine glass, and it is not accompanied with a slice of lime. So, future searchers, search no more: if you are looking for the authentic (ish) recipe for the buñueloni cocktail, the one actually used (we think) by Buñuel, go to my recipe here. When my husband and I arrived in Oregon, we went blueberry picking at a farm just outside of town. I had picked blueberries in my childhood, but in Michigan blueberries grow in bogs on small bushes, not on hills in hedges that are higher than my head, so I dressed in waterproof boots and slathered on the mosquito repellent, not bothering to bring a hat. A few hours later, he had wandered off with his bucket to quaff fresh blueberry juice at the home base, and I was sunburnt and lost in the foliage. Finally, I made my way back, branches in my hair, a huge pail of blueberries. We ate them for weeks, often by the handful, then in crumbles and pies, then in jams and syrups, and still our freezer held as many as it could store. Oregon’s Willamette Valley – can you see why people call this place paradise? The nice thing about frozen blueberries is that you can bring back a bit of summer to the dead of winter. 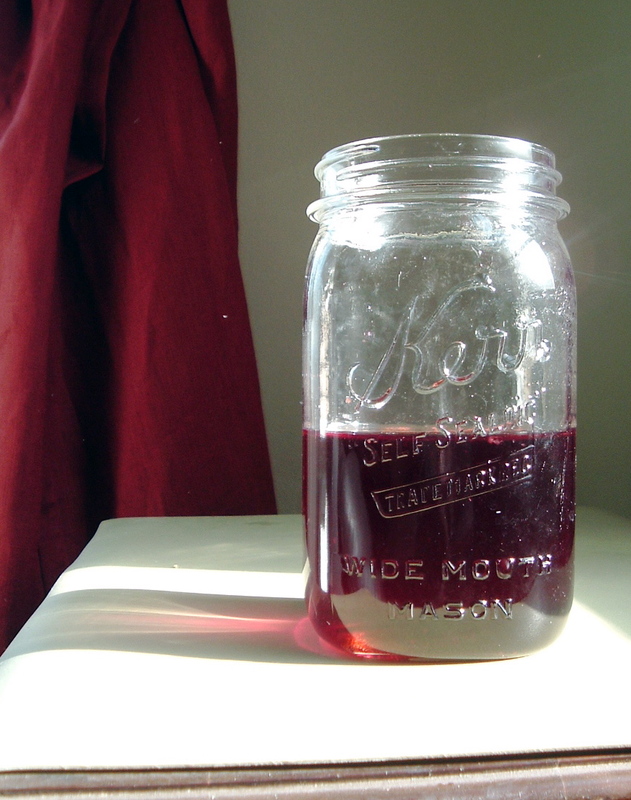 I’m cleaning out my freezer right now, and I have just enough to make a new batch of my Summer Blueberry Liqueur. It doesn’t take up much space or time to put up, but you do need to devote some time to filtering the liqueur. This liqueur can be sipped and used in cocktails, but it also adds a perfect blueberry note to fruit salads, and crumbles, in whipped cream and poured over pound cake. I add some to my blackberry jam. In short, it’s one of my kitchen staples. Since I first made it several summers ago, I’ve had some on hand. If you cultivate a few staples like these that make your cooking special, you can add your own style to every dish you make. 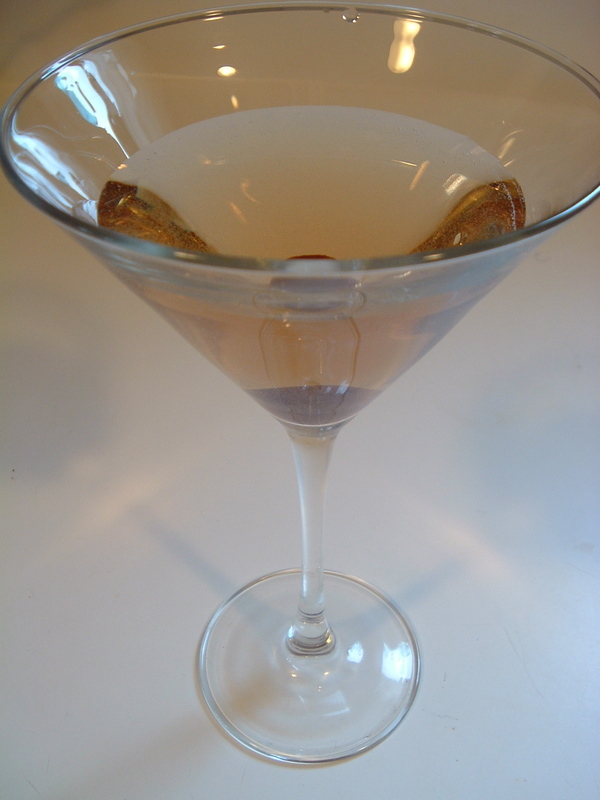 You will need several months processing time to make and age this liqueur. Ideally, use big, plump, juicy blueberries you picked last summer and froze whole. If this isn’t possible, use organic frozen blueberries. Don’t worry about the simple syrup yet. Let blueberries thaw, mush them up well to release juices. You are using frozen berries because they are much juicier than fresh ones. In a quart jar with a tight-fitting, removable lid, add the blueberries, the vodka, and the lemon peel. Steep for at least one month in a cool, dark place (no need to refrigerate), shaking gently every couple of days. Now worry about the simple syrup. Boil two cups sugar to one cup water. Watch carefully once it starts boiling, because there will be a point where the liquid will suddenly go from cloudy to clear. When this happens, and the liquid is completely clear, you have succeeded in making simple syrup. Let cool, then use 3/4 cup for this recipe and the rest for your iced tea or lime rickeys. Can be stored in the refrigerator in a clean bottle. Open the blueberry jar, and strain the liquid from the berries. Filter the liquid three times: (1) through a sieve, (2) through a double layer of cheesecloth on the sieve, pressing down on the berries as much as you can to get out all the tasty berriness, and (3) through a gold coffee filter fitted atop a large funnel, and don’t skip this step, because it’s the one that will give you a ruby clear liquid. The last filter will be very slow. I find I need to rinse this filter several times because it gets plugged up completely with sediment. Place liquid in a clean quart jar, then add 3/4 cup syrup to liqueur, shake well, and age for another month or two in a dark place. You may freeze the berry residue for use as alcoholic topping for ice cream, but I find the taste is a bit too harsh. Many of the recipes online will tell you to add a few whole cloves or coriander – because I use this recipe for so many purposes and need to communicate “BLUEBERRY!” I prefer a clean blueberry taste, but you might like something spicier that acts as a counterpoint to the blueberry. February 22 marks the birthday of my favorite director, Luis Buñuel, and I wouldn’t be happier if you were to join me in celebrating with a martini. Primordial in his life, said Buñuel, the martini provokes or sustains reverie, and thus I find it crucial to have at least a martini or two if one is to understand his oeuvre. His martini recipe is discussed in his autobiography, and in the short biographical film El Náufrago de la Calle Providencia (Castaway on the Street of Providence) (1971), which is appended to the Criterion DVD of The Discreet Charm of the Bourgeoisie. If you really want to show off your Buñuel chops, though, bypass the martini and head straight for his creation, the Buñueloni. 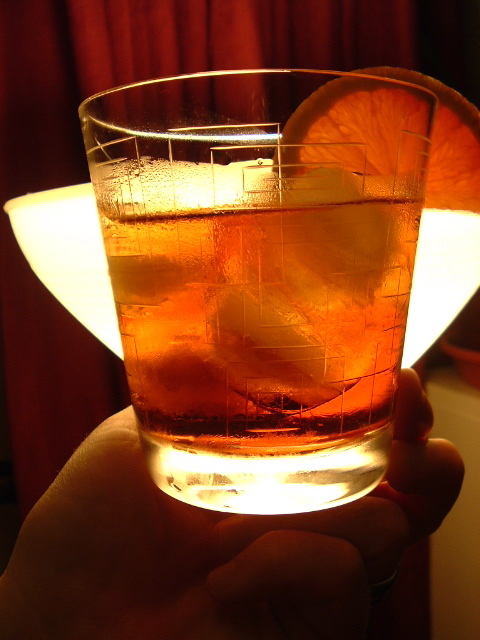 In the documentary, Buñuel mixes up a pitcher of these beauties, which he claimed were 3 parts gin, 2 parts “Carpano,” and 1 part Cinzano or what he called “sweet martini.” These were served over ice in a tall glass with an orange twist, and the drink was deeply colored (red or brown). Simple enough, you think. But would you expect simplicity from the man who brought you the Andalusian dog? The problem with his tutorial is that Buñuel doesn’t pour what he says he’s pouring. We got our geek on, and we discovered that he actually pours 1.5 gin, 1 Carpano, 1 (or maybe a skosh more) Cinzano. As you can see, the proportions are quite different. A larger problem is that Buñuel doesn’t specify which “Carpano” he means. 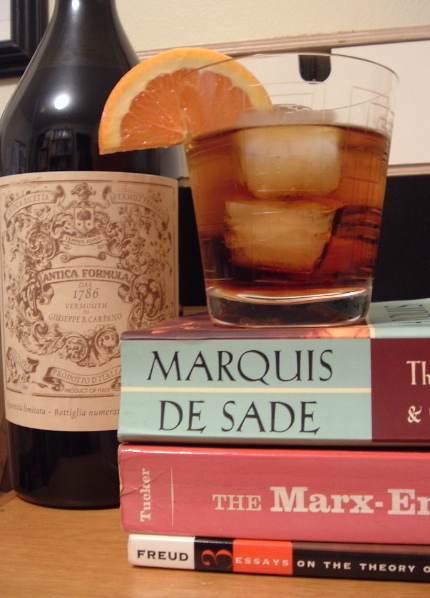 Because the drink is supposed to be a modification of the Negroni (1-1-1 gin-Campari-sweet vermouth), and because Carpano almost always signifies Punt e Mes in latter-day US of A, I initially thought the bitter Punt e Mes would be the substitute for the bitter Campari. But is it? 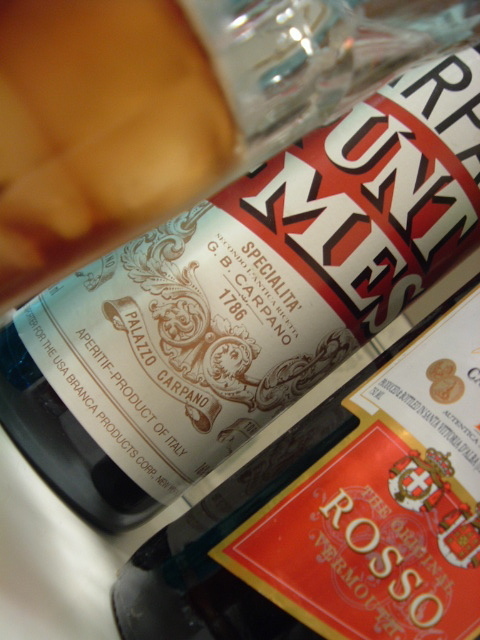 The Carpano family has been making four kinds of vermouth since, like, forever in Italy: Rosso (also called Classico), Bianco, Antica Formula (softer, gingerbready, chestnut-colored, complex and the most expensive of the four), and Punt e Mes (reddish-brown, raisiny, extra bitter). Since Buñuel didn’t specify which one, one might assume he meant “Classico,” but because he mentions the drink was expensive, he could have meant “Antica Formula,” which commands a higher price than the other Carpanos in Italy and the U.S.
Carpano Antica retails in California at about $30 for 1L and is hard to find. Punt e Mes, which is slightly cheaper at 750 mL/$21, is available at BevMo. 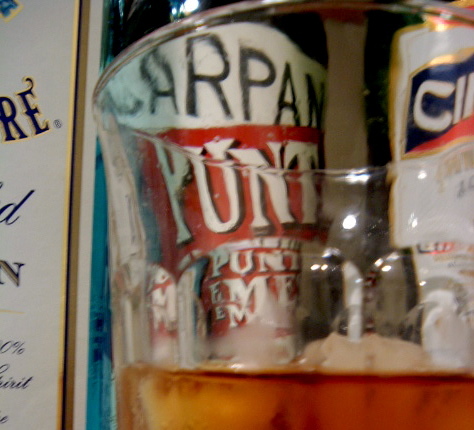 Since 2002, Punt e Mes has been owned by the people who make Fernet Branca, Fratelli Branca, and there’s just one place on the bottle that mentions Carpano, but you’ll still see it marketed as Carpano Punt e Mes. The Classico isn’t available, to my knowledge, in the U.S. I managed to get my hands on a bottle of Antica and poured myself a Buñueloni with it. Oh. My. God. The drink was still a warm, reddish brown, but the similarities ended there. The Antica smoothed all the tears of the bitter Punt e Mes away and left a comforting, haimisch spiciness that was absolutely lovely. It *completely* transformed the drink. It was sweet, and yet not cloying in any way. I might call it flirtatious — warm, supple, a skosh mysterious, coy, hints of bitterness, with an undeniable kick that lingered. By the second sip, I was mesmerized. It was perverse seduction, forbidden attraction, the pinch of love, necrophiliac fantasies, the caress of a shoe, a maid, a revolutionary cornered, the beat of wings, the path to salvation, mud flung, a sudden gunshot, the moon, the clouds, the moment of suspense before the razor strikes. Glorious. So, without further ado, the final recipe. Stir and pour over ice in a highball glass. Garnish with an orange slice. Drink with likeminded friends, or alone with the Marquis de Sade, Freud, Marx and Engels and/or the entomologist Lucien Fabre, all cherished by Buñuel. Perhaps the less said about this, the better.